With the fall season upon us, many areas of the U.S. will experience cool temperatures overnight and in the morning with warm temperatures throughout the day. With the temperature drop overnight, many car owners start their cars only to find a pesky “Check Tire Pressure” light on their dashboard. What does this mean? 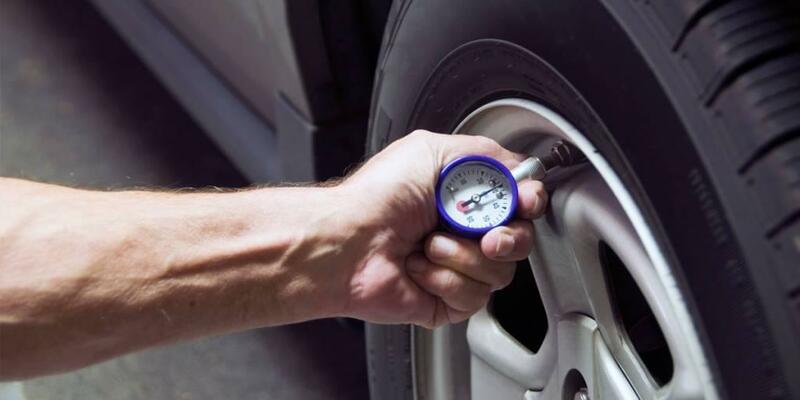 It means it’s time to check the air pressure in your tires! Why is Checking Tire Pressure Important? When you think about it, only four small patches of rubber maintain grip and control between you, your vehicle, and the road. Improperly inflated tires may reduce adhesion and control, leading to greater stopping distances and a heightened chance of hydroplaning in inclement weather. You tires were engineered for specific PSI levels that ensure optimal contact with the road. Over-inflated tires put excessive pressure on the center tread, while under-inflated tires roll excessively onto their sidewalls when turning. Both mean a loss of traction, lessened water evacuation, and increased wear and tear due to scrubbing off of rubber and uneven heating, meaning you’ll need to replace them sooner than the manufacturer intends. If your tires are improperly inflated, your vehicle will make sub-optimal contact with the road, causing your engine and tires to work harder to overcome contact friction. As a result, you will reduce fuel economy. Why Did My Vehicle Lose Tire Pressure Overnight? Fall weather in many areas can bring a large fluctuation between daytime and nighttime temperatures. These changes in temperature can cause your tires to lose pressure as the air inside them expands and contracts, triggering the “Check Tire Pressure” light on your dashboard. Don’t panic: the light does not necessarily mean your tires are leaking. As ambient temperature levels change, so does the air pressure within the tire. It’s the same as when you drive at higher speeds for an extended period: the tire warms, and the air within expands and increases pressure. During the fall season with daytime temperatures in the 70s and 80s falling overnight to the 40s and 50s, you may need to check your tire pressure more often. 1. Check tire pressure when your tires are cold. To ensure an accurate reading, it’s best to check tire pressure when your tires are cold. The morning before driving is best (usually right after you see that “Check Tire Pressure Light”) or after at least two hours of the car sitting, preferably not in the direct sunlight. If you don’t have a gauge or pump at home and need to visit a service station, try the closest station on the first drive of your day. If you’ve been driving more than 15 minutes or if your tires have been sitting in the bright sun, inflate your tires to 2 PSI below the recommended pressure. Regardless of the circumstances, if your tire pressure warning lamp comes on or you notice a tire is low, inflate your tire as soon as possible. You can always measure and adjust it properly at the next opportunity. 2. Use a high quality pressure gauge. Most service stations have high quality gauges and allow you to check and adjust pressure free of charge. For the DIY driver, you can purchase these at most auto parts stores or online. For example, Amazon offers good options for both a dial-face gauge and a digital gauge. If you want to inflate your tires at home, pick up a portable compressor. 3. Check tire pressure routinely. Every 20 degree change in ambient temperature can lead to tire pressure changes that impact tire performance, tread wear, handling, and fuel mileage, so be sure to check routinely as temperatures drop in the fall and winter seasons. Quick note: if a service shop offers an “upsell” to nitrogen to fill your tires, it generally isn’t worth the price. That is unless you have a high performance vehicle that you often drive on the track or for extended periods at high speeds. If you don’t fall into that category, save your money and stick with air in your tires. As we’ve discussed here, proper tire inflation impacts grip, water evacuation, tire temperature, wear, and fuel mileage, so be safe and heed those warning lights! 3 comment(s) so far on What Causes Tire Pressure Loss Overnight?